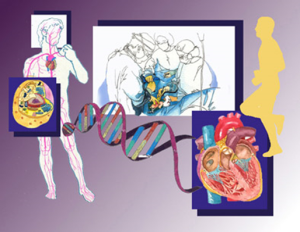 On November 25, 2013, the San Diego Clinical Research Network held a meeting at the Sanford Consortium for Regenerative Medicine, with a reception at Bella Vista Cafe. Three speakers talked about innovations in clinical trials. J. Summer Rogers, Chief Executive Officer of nPruv, Inc., a company which acts like a “match.com” to match up patients and clinical trials, moderated the event. The first speaker, Marcos Milla, Ph.D., Scientific Director and Fellow at Janssen, spoke from the pre-clinical research perspective about the search for drugs and patients by phenotypes. New thinking about entire systems within a cell versus a specific target, allows complex cellular systems as a whole to be targeted. Given the intricacies of problems with the immune system, this way of thinking will simplify a complex milieu. Executing these experiments is the simple part. A more difficult question is interpreting them. One approach employs phenotypic read outs: proliferation, migration, contact, differentiation, and activation. These phenotypes can be read with automated systems, enabling high throughput screens. Next, gross readouts of cell behaviors must be correlated with molecular readouts to permit determination of structural activity relationships. To accomplish this, functional readouts need to be deconvoluted to concrete “hits”. 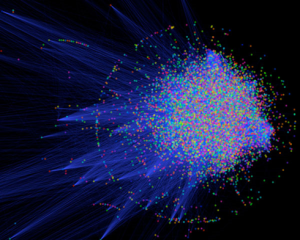 Harnessing knowledge of the human interactome will facilitate this goal. Clinical trials can target complex pathways in the human interactome. An example of this workcan be found in the eicosanoid biosynthetic pathway. High throughput and high-sensitivity liquid chromatography mass spectroscopy is utilized to acquire data from three different phenotypically-normal, healthy patients exposed to prostaglandin inhibitors. All three displayed remarkably different profiles. Differences in these profiles suggest different drugs would be most effective for each patient. One method to optimize these interactions is to bring together the wide variety of “-omics” (genomics, metabolomics, proteomics, etc.) to build a drug profile for each individual patient. This information could then be used to optimize individual treatments for specific patients. The next speaker, Andreas Koester, M.D., Ph.D., VP Clinical Trial Innovation & External Alliances, Janssen, spoke about clinical trial innovations spawned by collaborations between large pharmaceutical companies, and a patient-centric approach to designing trials. As a leader in clinical trial operations, he offered a different perspective. As a potential drug journeys through the research and development process, out of 10,000 compounds, 1 new drug will be approved by the FDA. Presently this process costs about 2 billion dollars and takes 10 years. How can we better spend our time and money? 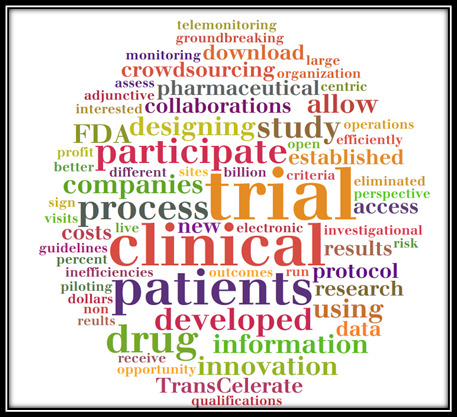 A collage of words from Andreas Koester’s talk on improving clinical trials. We need to change how we design clinical studies. Patients should be first in mind in designing trials. Collaboration between drug companies will streamline this process. TransCelerate BioPharma, Inc., a non-profit organization established by leading pharmaceutical companies to advance innovation and tackle inefficiencies in R&D, is an example of this. TransCelerate has developed guidelines for risk-based monitoring to reduce the cost of clinical trials, and established criteria for the qualifications and training of clinical research sites. A Blue Button™ Initiative begun by the Veterans Administration to allow patients the opportunity to access and download their health records is being extended to clinical trials. Pfizer is piloting the use of Blue Button™ technology to enable participants in Pfizer trials to download their own electronic clinical data collected in the trial. Patients sign up after the study to get data results through a third party. Normally patients receive no information about the results of a clinical trial in which they participate. By allowing patients access to this information, patients are more engaged with the process. Novartis is partnering with Walgreens to bring clinical trials to the patient. Ninety percent of all Americans live within three miles of a Walgreens pharmacy. No longer must patients interested in participating in clinical trials travel scores of miles to participate. Novartis is currently doing a novel trial, allowing study participants to have their follow-up visits at Walgreens rather than hospitals, in an attempt to run the trial more efficiently and scale more widely. Recently, the FDA allowed a trial for a investigational new drug (IND) with a clinical trial protocol developed using crowdsourcing. The open innovation drug developer, Transparency Life Sciences, gained FDA clearance to proceed with a phase II trial of the antihypertensive drug lisinopril as adjunctive therapy in multiple sclerosis. This groundbreaking, crowdsourced protocol also eliminated most study visits by using telemonitoring to assess outcomes. The final speaker of the evening, Steven Steinhubl, M.D., Director of Digital Medicine at Scripps Clinic and Scripps Translational Science Institute, spoke about using mobile health technologies (mHealth) to conduct patient-centered clinical trials. The change he advocates in clinical trials is to “move the mountain,” by bringing clinical trials to patients. Presently healthcare is designed around the physician and not the patient. Clinical trials are also designed around physician investigators. The biggest driver of cost for clinical trials is Phase III testing. Ninety percent of the cost is associated with this step. Mobile health technologies can allow us to do studies more efficiently, and reduce costs. However, there are cultural and regulatory barriers to implementing mobile health technologies into clinical trials. 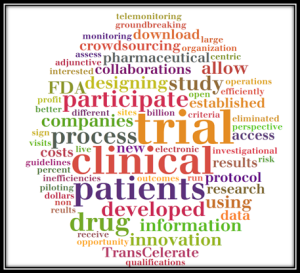 Translational medicine employs clinical trials to move ideas from research to the bedside. Another area needing change is the average lag time between a definitive clinical trial and changing the majority of clinical practice. Currently it is 17 years. Although 17 years is unacceptable, from a historical standpoint we are improving rather dramatically. For example, it took 264 years for vitamin C use (via citrus fruits) on ships to prevent scurvy to become common practice after a definitive study. During discussion, the panel agreed that the device and pharma industry need to be integrated from invention through clinical trials. Perverse financial incentives for reimbursement on devices encourages the creation of a new device to accompany every new test. This needs to be fixed. Ironically, medicine is the only industry where more technology increases costs. This entry was posted in clincial trials, San Diego Clinical Research Network and tagged clinical trials, drug company, interactome, San Diego Clinical Research Network on January 12, 2014 by admin.